Even thought I wrote this post in May 2013, the information in the post is still current. There are only minor changes: now more banks than in the past, and easier access to ATMs. Accommodation prices have continued to rise, but I suspect they will even out in the next 12-18 months. Lonely Planet: Myanmar did release an updated edition in July 2014 which updated things like pricing to bring it closer in line with how things are currently. Not much else seemed to be updated, and there were some oddball mistakes that I came across, so I'm assuming it was a very minor update for this addition. Check out my other pieces in Myanmar / Burma and Myanmar Travel Tips for more details. I'll start by saying that I'm not a huge fan of guidebooks. In the age of the internet and nearly limitless access to information, the printed word is often already out of date when it's still rolling off the presses. For example, the latest Myanmar Lonely Planet (11th ed.) was published in Dec 2011, with much of the research likely done 3-12+ months prior. As of May 2013, much of the information could be 2 or more years out of date. 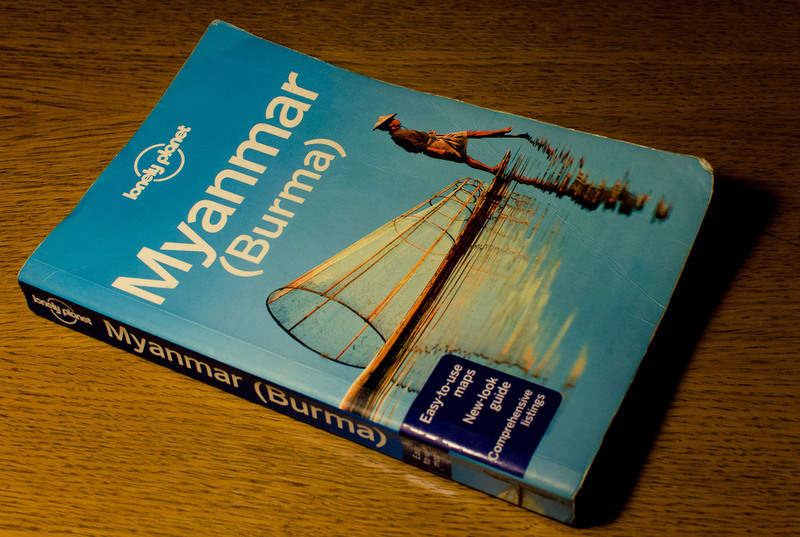 That said, I've had my Lonely Planet: Burma/Myanmar since my first big trip to the country in early 2012, and I'd recommend taking it (and especially a phrasebook). Last updated only months before I bought it, much of the information at the time was fairly fresh and up to date in a way that was impossible to beat with the little information to be found on the web of the country. Not only that, but accessing the internet while in the country is at best a slow and frustrating process, and often not even an option. But the problem is that it's leading people astray. Too many people treat it like gospel, and in a country like Myanmar (Burma) that is changing so rapidly, much of the information is not only inaccurate, but in some cases completely the opposite. Now to Lonely Planet's credit, they do have some updated resources on the web, but not one traveler I've spoken with had checked it before they embarked on their journey. So here are some things to note when treating your Myanmar Lonely Planet guidebook as the book of the travel gods in Myanmar. The first thing on many people's minds when they come to the country is money. With severe sanctions against the country until mid-2012, it meant that there were no international banking ATMs in the country, and all cash you needed for your trip had to be brought in with you as pristine $100 USD bills. According to the Lonely Planet, Burma also uses FEC (which was essentially the Myanmar government's traveler money, with $1USD equal to 1FEC), but in all the time I've spent in the country over the past couple of years, I've never seen one except behind glass at a tourist shop. You'll pay for everything in USD or kyat, the local currency. The biggest problem in the Lonely Planet: Myanmar is where it discusses exchanging money. The guidebook recommends changing on the black market to get the best rates, and to avoid the official changers. The black market could be the local markets, jewelers, or even hotels (at a less favorable rate). One of the most popular places to change money for most tourists entering the country happens around Sule Pagoda in central Yangon where many hotels for foreigners are nearby. Walking around, you'll literally have dozens of men lined up along the sidewalk repeatedly asking "change money?" while waving stacks of 80-90 1000k notes wrapped in rubber bands. The answer is no. This is the best place to get scammed, and I've met many tourists that learned the hard way. Often they snag a tourist who has been turned off from exchanging in the bank or airport by the guidebook, and offer a better rate than you'll find elsewhere. Unlike banks (who will give you 5000k notes, approx $4.50USD), these changers will change in shabby 1000k notes. That means that for your $100 USD bill, you'll receive a wad of ~140 notes in return. They count it out in front of you, sometimes a couple of times, with minor issues here and there, and after using a little slight of hand, send you away. As you re-count your kyat on the street, you find you're usually about 20000k short (about $16USD). When you turn around, they're gone with the wind. Since March 2012 (perhaps a couple of months earlier), only months after the latest Myanmar Lonely Planet was published, the airport and banks are now the best places to change money. The best, and most fair rates were to be had here, with very little chance of any issues. Even small towns like Pindaya in Shan State have a bank that you can change money at. Essentially as it was published, this was changing. With the economic sanctions being lifted, it has opened the way for companies like Visa and Mastercard to offer their services in the country beginning in October 2012. You can read more about ATMs and everything else having to do with money while traveling in the country in my article "How To Deal With Money in Myanmar (Burma)". Grace hotel in Pyin Oo Lwin, Shan State. The fonts remind me of Hitchcock films of the 50's and 60's. There has been a lot of talk about Myanmar being an expensive country to travel in. This is just not true. While some things here do cost more than neighboring countries such as Thailand, by and large, the country is still very cheap to travel in. The biggest changes in cost have come in accommodation. With the influx of tourism in the past 48 months, guesthouses have raised prices in light of the surging demand, but also the rising costs on their end as well. In Yangon, I was told by guesthouse owners that electricity and water prices have doubled or tripled in the past year. Add to that the cost of adding services such as wifi for their customers to the tune of $500 to $2000 just to run the line, and they need to make that up there somewhere. So due to both of these changes, prices of accommodation are often double the price listed in the Lonely Planet Burma guidebook. For example, "White House" in Yangon is listed as being $14 for a single with air con. This has steadily risen over the past 12 months to $25-$35 for a single with air con. Golden Kalaw, one of my old standard guesthouses in Myanmar, lists as single/double @ $5/$8 (with bath), which is now $18/$26. This isn't the case everywhere though, and rates in Pindaya, a small town that sees less foreign tourists, hasn't seen the same sort of rate increases. Myit Phyar Zaw Gji, a hotel on the lake (and my pick for Pindaya), is still the same $10/$15 single/double. Golden Cave Hotel, popular with package tourists, has bumped its old starting price from $20 to $30/night. 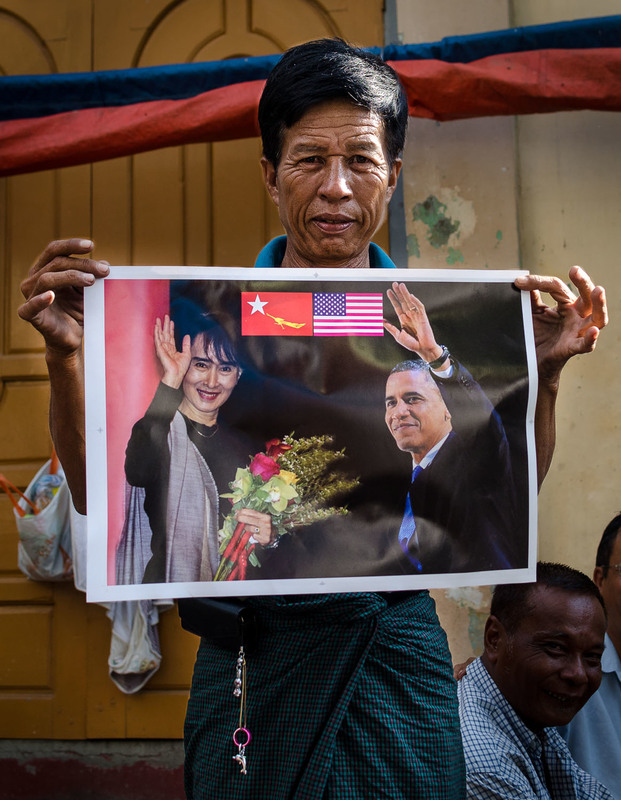 A local taxi driver shows his new poster of Aung San Suu Kyi and Barack Obama the day after his historic trip to Yangon in November 2012. Given its shady political past (and current mind you), there has been much said about not getting locals in trouble by avoiding mentions of politics, the NLD (National League of Democracy party) or Aung San Suu Kyi. I was so careful after reading this that, on my first trip to the country, I would only ask vague questions on these topics, and that was only after locals themselves brought it up. There was also some talk about the secret police following foreigners and listening in to conversations. Times have changed, and in April 2012, Daw Aung San Suu Kyi was herself elected into the parliament. The NLD party swept nearly all of the seats in the bi-election. In 2015, the NLD won the last major election by a landslide. Like anywhere in the world, some people like talking politics, and some don't. Myanmar is no different. So if people want to talk politics, they will. You may see a lot of stickers, flags, calendars, and posters of the NLD flag or Aung San Suu Kyi herself. Try starting a conversation with a shop owner who visibly displays something publicly like this. The idea of the "walls have ears" and all of the government spies lurking around the corners is essentially false these days. No one I have spoken with has been able to confirm anything of the sort in the past year or more. Former political prisoners, people involved in the past and current political movement, and regular citizens have shown no fear of anyone hearing what they have to say, even when I ask them about the potentially dicey issues. It was much different a few years ago however, and a good way to get some insight is to watch the documentary film "Burma VJ." This documentary tells the story of the videographers who were filming the protests in 2007/2008 and sneaking the footage out of Myanmar to tell the world about what was happening inside their closed country. Many of the people involved were thrown in prison, fled the country or simply "disappeared." Pick up a copy of Burma VJ and watch it before you go for a little perspective. The Myanmar embassy in Bangkok. It's best to arrive early to beat the crowds when applying for a Myanmar visa in Bagnkok. In the past, if you were a journalist, photographer, or the like, you may be denied a visa to enter Myanmar / Burma. Many would attempt to get around this by listing a different occupation on their visa forms and work history. I've even been told that the officials became savvy over time, and would google suspect names to see if they were indeed journalists, and deny them if they had lied. This is no longer an issue. Journalists were everywhere during the April 2012 election, filling hotels to the brim to cover what happened. In more recent months, the government has talked about making it even easier for journalists to enter and stay in the country. Now even those they know are journalists are allowed entry without problem. The embassy in Bangkok not only issued a visa for a journalist friend, but doing so while seeing his press visas from other countries in his passport, and expediting the process for him so he could leave on a flight in a few hours. nd for most, it's super easy to get a visa thse days. In fact, you can do it all online through the official evisa for Myanmar site. So there are some updates to keep you in the know. Remember that the guidebook is only a guide, and let the country and its people take you on the journey. Lonely Planet Myanmar is a document of a time and attitude, but it shouldn't be the last word on how you engage with this rich and vibrant culture. Well staffed complaint station in the Yangon railway station. If you liked this article, check out my other Photo Stories, travel tips for the country and all the rest of my articles on Myanmar / Burma.